Like most lip balms apply as needed. 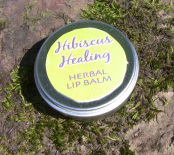 This one is especially great at night for full lip therapy while you sleep. It's also perfect for daily wear because Shea butter is a natural sun screen. Calendula, St. John's Wort and Chamomile Flowers Oil in Organic non-GMO Canola Oil blended into a base of African Shea Butter, Organic Aloe Butter and (local) Beeswax. Comes in: Unscented, Cardamom, Rose, Anise-Basil and Rosemary. Please specify in comments when you order which scent you prefer.